Above: Michelle Dolgow Cristofaro (front row, second from left), Director of Programming & District Communications and Jose Rodriguez (front row, third from left), Executive Director of District Operations, Office of New York State Senator Jeffrey D. Klein and Thomas P. Messina, Sr. (back row, center), District Representative, Office of Congressman Joseph Crowley, are joined by Charles Rutenberg Realty, Inc. representatives Ruth Pfeffer (front row, second from right), Real Estate Associate Broker and Office Manager; Richard Diller (back row, second from right), Real Estate Associate Broker and Commercial Division Director; and Joseph Moshé (front right, right), Real Estate Broker/Owner and local Charles Rutenberg Agents at the ribbon-cutting ceremony for the Agency’s new Bronx office. 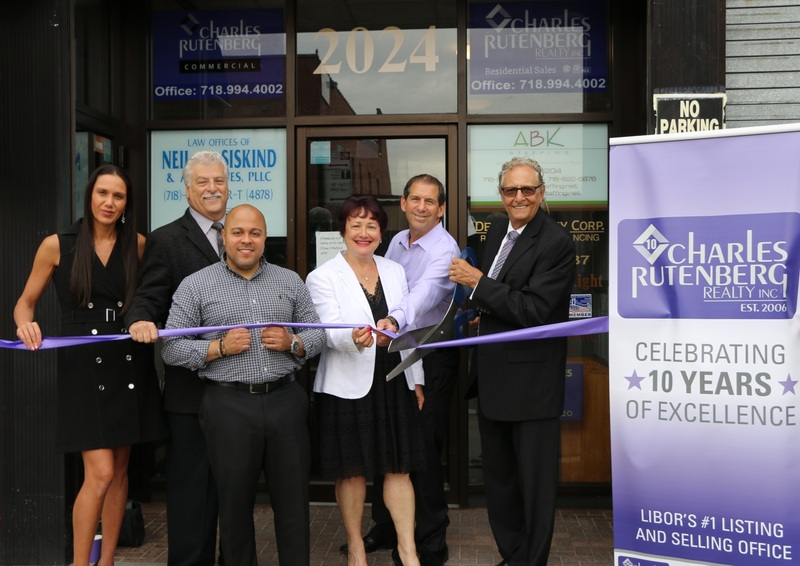 As part of its mission to continually revolutionize the Real Estate industry, Charles Rutenberg Realty, Inc. has decided to increase its Bronx footprint by expanding and moving into a new location at 2024 Williamsbridge Road. Now celebrating its 10th year, the Agency commemorated the move with a special ribbon-cutting ceremony on June 16. Located in a convenient, beautiful section of the borough, the Bronx office will serve as home base for more than 30 Charles Rutenberg Licensed Real Estate Agents, a number which is expected to double by the first quarter of 2017. Though the Agency previously had a very small Bronx location, the new office is expected to attract attention from local Real Estate professionals. 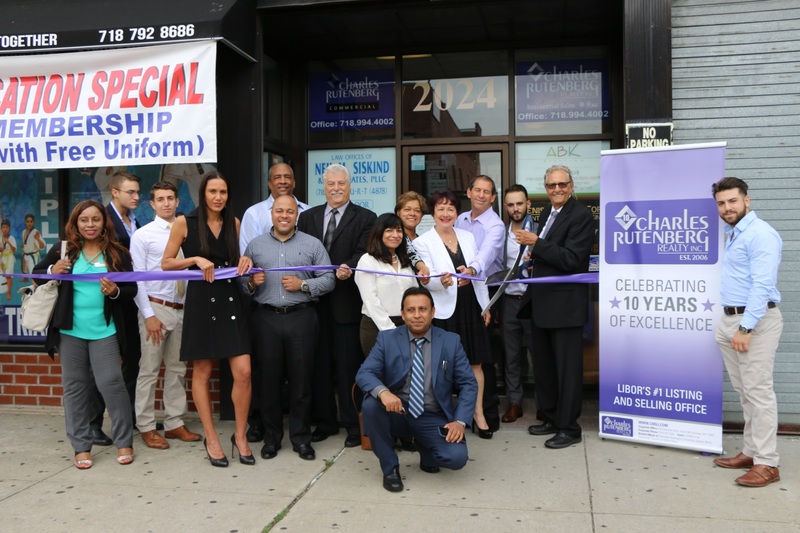 "The main objective in opening the new Bronx office is to help all local Bronx Real Estate Agents further their earning potential," says Joseph Moshé, Broker/Owner of Charles Rutenberg Realty. "We also want to increase our presence in the borough and provide a service to the community that will enable local residents to achieve their housing goals. We know this office will be instrumental in these endeavors. With the housing market back on an upward trend, we know that our Agents will be successful in this region and we look forward to all of the opportunities they have in store." Charles Rutenberg Realty was once a fledgling Agency with a modern vision. Over the past 10 years, it has been transformed into a state-of-the-art firm with eight offices and a roster that grows by the day. The company offers its Agents first-class training, team-building activities, cutting-edge technology and the best compensation program in the industry, which keep it at the forefront of the industry. The National Association of REALTORS® named Charles Rutenberg Realty, Inc. among the top five firms in New York State. As one of the nation's fastest-growing Agencies, with nearly 1,000 associated Real Estate Professionals, Charles Rutenberg Realty, Inc. is proud to serve Nassau, Suffolk, Queens, Brooklyn, Bronx, Westchester, Putnam, Rockland and Orange Counties. For more information, visit www.crrli.com. Above, from left to right: Michelle Dolgow Cristofaro, Director of Programming & District Communications, Office of New York State Senator Jeffrey D. Klein; Thomas P. Messina, Sr., District Representative, Office of Congressman Joseph Crowley; and Jose Rodriguez, Executive Director of District Operations, Office of New York State Senator Jeffrey D. Klein, along with Charles Rutenberg Realty, Inc. representatives Ruth Pfeffer, Real Estate Associate Broker and Office Manager; Richard Diller, Real Estate Associate Broker and Commercial Division Director; and Joseph Moshé, Real Estate Broker/Owner.